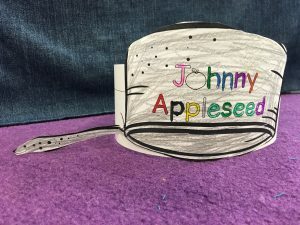 Johnny Appleseed Fun – Craft, Fingerprint Apples, & More! 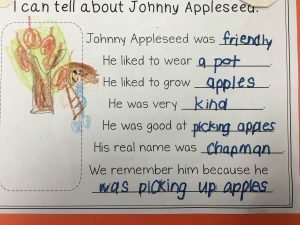 We started our unit on Johnny Appleseed today. 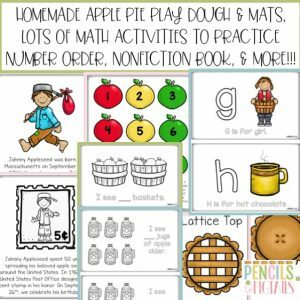 I’m thrilled that all of the activities included in my TPT store will be more than enough to keep us busy for this entire week in both reading and math. 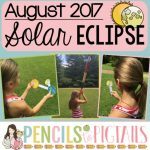 (A little science experiment is thrown in there too!) You can grab your copy by clicking on the cover below. 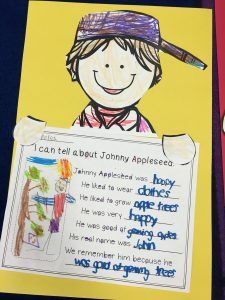 I told them that by the time I read them the nonfiction book included they would know so much more about this important man. 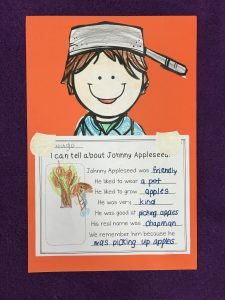 We read through the book that is included in the resource and paused to discuss each page. 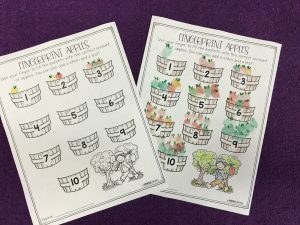 The illustrations in the resource are clip art images from Corinne with Chirp Graphics. 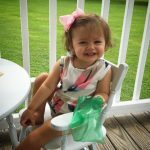 She is so talented! They are absolutely precious. After we finished the book, I had them go to their seat and instructed them to draw a picture with lots of detail in the space provided. 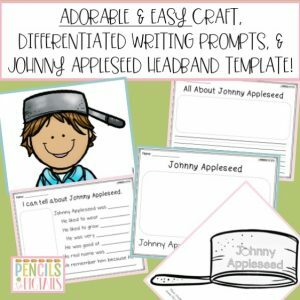 Meanwhile, my assistant and I made our way around the room asking students the questions on one of the differentiated writing pages included and writing down their answers. 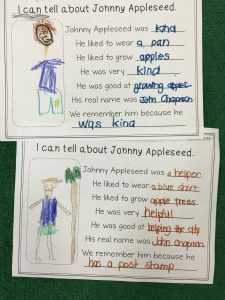 I had them use a skinny marker to trace the words that we wrote. (Remember- this is only our 2nd month of kindergarten.) There are some easier and more difficult writing pages included but I just wanted to use this fill-in-the-blank one. There is an adorable craft included and we finished the first part today. Tomorrow we will add aluminum foil pots to the heads. I’ll share a post tomorrow after school so you can see how much cuter they are. 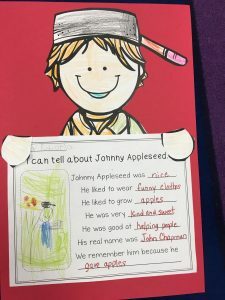 For now, this is how Johnny Appleseed looks. 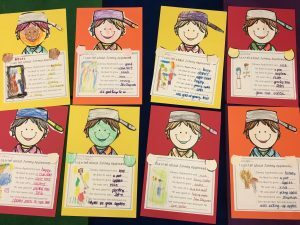 We glued them to long construction paper. I laid out fall colors as I thought that would make a pretty display in our hallway. 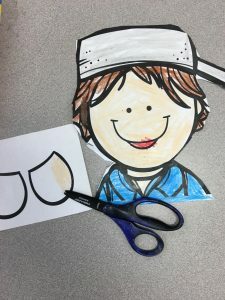 I think they already look adorable and can’t wait to see them when the pot on their heads is transformed into an even more eye-catching one with aluminum foil. Later I divided the kids up into 2 groups. 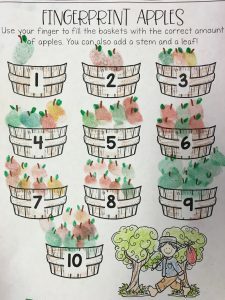 One group worked on these fingerprint apples and the other worked on the headbands (This was mainly because I only had a few sets of ink for the stamps.) As they finished they moved on to the other activity. 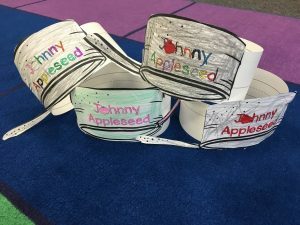 We will wear our “pots” to lunch tomorrow in honor of Johnny Appleseed’s birthday. I printed the pot on regular paper but later wished I would have used cardstock so that the handle stood a little bit straighter. Oh well, you live and you learn! I set morning work out for tomorrow on each child’s table. I went ahead and created a sample for some of my lower students to reference as needed. 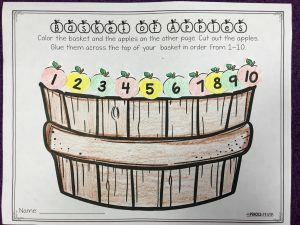 This unit has so many fun activities for you to practice number order and number recognition. 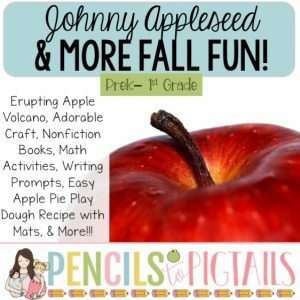 It’s so much fun that your kids won’t even realize how much they are learning! I will post again tomorrow with an update of what else we were able to finish. (You can now click the link at the bottom to see the next post! 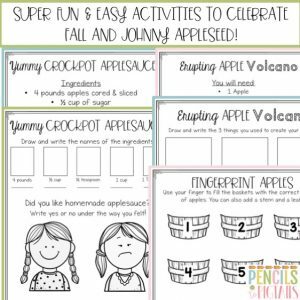 So much to do this week with this resource… easy crockpot applesauce, apple picking games, erupting volcano apple, apple pie play dough, & more! It’s going to be a fun week for me and my students. 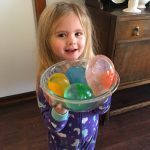 I know they are going to love those play dough mats. They turned out really cute. Click on any of the covers below to grab your copy of the resource. Activities for the entire week for just a few dollars??? Yes, please! 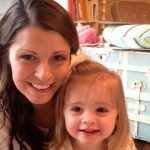 Happy Teaching and Mommy-ing today! See you back here tomorrow! You can now click here to see my next post! I was аbⅼe to find good advice from your blog posts.